Disney films for me represent happy times during an age of innocence. DVD look-backs emphasize joy of attending first-runs where turnstiles hummed and everyone whistled a merry tune. What actually went on behind showman curtains was not so idyllic. A Cold War in news headlines was mirrored by one fought near as ferocious by the industry’s mutually suspicious distribution and exhibition arms. Sometimes their war flashed hot. It seemed a non-stop game of one side trying to do in the other. Government sanctions broke up the trust that enabled film companies to control theatres in addition to producing and delivering movies, but home office powers were since nibbling around edges of the law to get back advantage they enjoyed when business was wide open and unrestricted. Independent showmen as ever took the brunt of policies squeezing them out of money generated by features expected to do well. 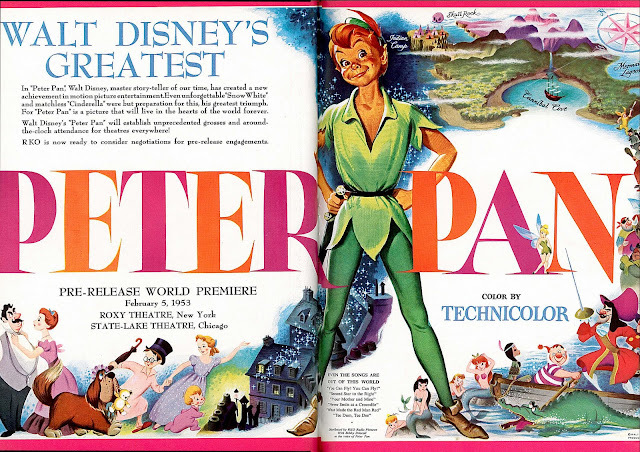 Peter Pan was such an attraction and came along at a fraying point between opponents spoiling for battle. Distribution’s latest scheme was to pre-release better product for advanced admissions. Never mind that consent decrees entered into by the majors forbade such price fixing. Contracts were slippery and complicated, but end result found theatres forced to bump ticket rates in order to get pictures their customers wanted most to see. The policy had been applied to Quo Vadis, Ivanhoe, The Greatest Show On Earth, and a number of others. Exhibitor groups pointed out that more titles had been sold this way in an eighteen-month period than in ten years going before. Pre-releasing was merely a device for keeping top attractions in larger houses for longer runs and depriving small theatres of opportunity to compete with subsequent playing at lower prices. Favored venues tended to be those affiliated with powerful chains. They had muscle to negotiate terms and guarantee a profit. Regular runs at pet locations would follow pre-release engagements often in those same spots, ignoring clearances independent theatres depended on to differentiate their playing time from pricier first-runs. By the time affiliated powerhouses were done, attractions were not so attractive, as national promotion and drum beating was timed to key dates. Small auditoriums wound up with shows gone stale for their public. Columbia led off 1953 with arm-twisting on behalf of highly touted Salome. They would pre-release the film only in cities of 75,000 or more, in effect foreclosing eighty percent of theatres across the country. Demands for increased admissions weren’t spelled out in booking contracts, but terms and guarantees made it impossible for showmen to run Salome unless they spiked ticket prices. The Allied Theatres group began drafting a complaint to the Department Of Justice. It was plain to them that film companies were colluding with powerful chains to starve little exhibitors out. By late March, producer Samuel Goldwyn was saying outright that Hans Christian Andersen would run only at advanced admissions, and if the exhibitors don’t like it, they don’t have to play it. Such incautious words aroused trade tempers and embarrassed distributor RKO, handler of both Goldwyn and Walt Disney output. Allied complainants were now looking for evidence of industry wrongdoing they could submit to the DOJ, with hearing dates set for April. A major smoking gun came courtesy the Walt Disney Company when a Cincinnati showmen defied Peter Pan pricing policy for an engagement beginning April 2. Rube Shor was a theatre/drive-in operator (and Allied spokesman) who’d had it up to here with high-handed treatment from distributors and decided to do something very public about it. 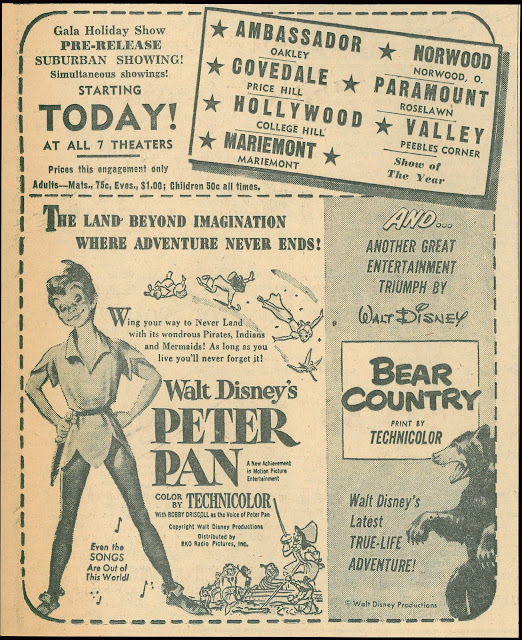 His drive-in and hardtop ad appeared on the same Cincinnati Times-Star page (shown here) as day-and-date Peter Pan announcements from seven rival theatres. Those venues listed higher prices per expectation of Disney, including fifty cents at all times for children. Shor let kids in free at his Twin Drive-In and emphasized No Increase In Admission on his ad along with a shot at Disney heard round the exhibition world … The management feels since this is not a "Quo Vadis" or "The Greatest Show On Earth," in spite of demands made by distributor, that the families are entitled to this entertainment at "REGULAR PRICES." According to The Independent Film Journal, Shor’s competitors suffered for the comparison, as ticket sales for the seven opposition screens were down. Disney sent Shor a telegram that same day and minced no words. The admission prices that you are advertising in today’s Cincinnati papers fail to meet the conditions of our approval and renders the approval ineffective. Seems Disney had booked Peter Pan with what they referred to as a specific understanding that Rube Shor would charge the same increased prices as other "pre-release" engagements in Cincinnati. But wait, wasn’t this price fixing in violation of the Consent Decrees? 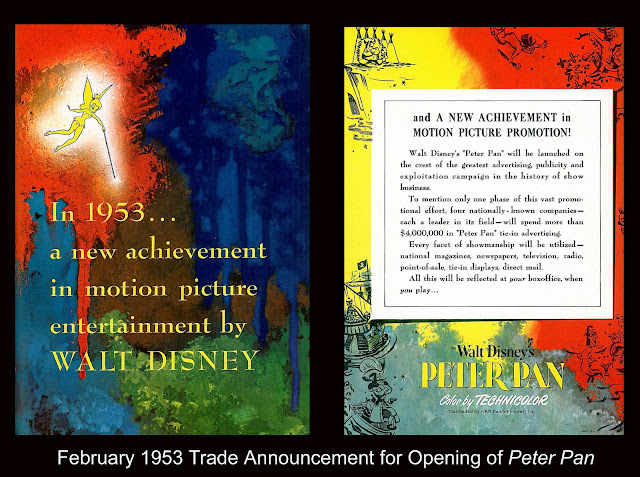 We understand that you have already received possession of prints of "Peter Pan" and this is to advise you that no print of Peter Pan" may be exhibited except under a contract approved by us and exhibition without such a contract would constitute a copyright infringement with serious penalties. Disney reminded Shor of specific ticket prices he was expected to charge. They also sent the telegram to his managers and warned them of personal liability for participating in copyright violation. Shor’s reply defended his right to charge whatever admission he saw fit for Peter Pan and that suggestions to the contrary from Disney or RKO amounted to their willful violation of anti-trust laws. In fact, Disney’s wire had implicated RKO in a violation of the Government’s anti-trust decree. Here was ammunition to go before the hearing board in Washington on April 15, with Disney’s telegram Exhibit A for complainants at Allied. Leo Samuels, the Disney sales supervisor who sent the wire, was suddenly backing off. We are not attempting to tell any exhibitor what to charge for "Peter Pan." We don’t care if he lets patrons in free, but we have a right to license the exhibition of our pictures as we see fit and to expect payment on that basis regardless of the theatre’s admission charges. That’s the exhibitor’s prerogative, not ours. Samuels added that he knew nothing about reports that RKO was asking exhibitors to put their admission prices in writing before contracts were signed. That got RKO skittish and assistant sales manager Walter Branson declared: We can’t make any statement. It’s all up to Disney. Meanwhile, Peter Pan was going into second runs at the same increased prices. Witnesses before the Senate committee said flat out that divorcement of producing and distributing from exhibition didn’t take, and maybe it was time to further separate producer companies from their distribution arms. Words like conspiracy and collusion were applied to industry distribution practices, with independent theatres helpless to operate for the benefit of small communities. One manager in Netcong, NJ testified that RKO wanted sixty percent of his Peter Pan receipts and even withdrew the booking after it had already been advertised. Walt Disney himself was in New York for a weekend and was asked about the controversy. Walt wondered how exhibitors expected a producer to spend three million on a picture produced especially for children and then not be given a chance to get his costs back. 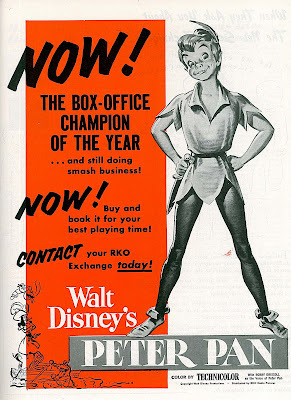 Disney said he’d not been informed of Rube Shor’s refusal to boost prices for Peter Pan, but that the showman might be in trouble if he violated his contract with RKO. In any case, Walt concluded, it was an issue for RKO’s sales department to work out. A campaign in favor of the public was what some exhibitors called a movement to stop inflated ticket prices and so-called pre-releases. National Alled was telling members not to rely on representations from RKO salesmen and supervisors, since without Disney’s stamp of approval, they had no real authority to confirm deals on Peter Pan. As hearings went into late April, rebuttal of Allied member testimony came from representatives of Loew’s and Universal: Where exhibitors find it possible to get together with their competitors, they either divide our pictures between themselves without consulting us, or they assign our pictures to one of the theatres in the locality in accordance with their ideas. We often find ourselves assigned to a second or third class theatre, which we do not like at all, because it greatly reduces our possibility of earnings, and, we feel, eliminates a free market. RKO was also there to claim that what exhibitors called pre-releases was merely deluxe marketing. 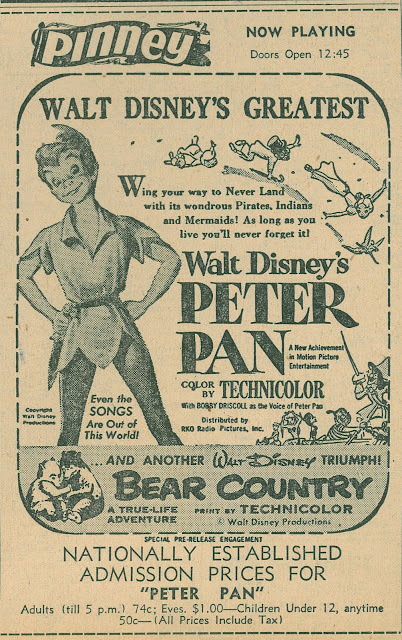 As for Rube Shor’s under-12 free policy on Peter Pan, that was nothing more than a showman’s attempt to cash in on increased concession sales by using the film as a loss leader. Admit youngsters gratis and they’d more than make it up at the candy counter. RKO also distanced itself from Disney in saying that the threatening telegram had been sent on the producer’s own initiative without ever consulting us (could this move have entered into Disney’s decision within the year to leave RKO and set up his own distribution arm?). Harrison’s Reports dismissed all of this as mere subterfuge. Companies were fixing prices but carefully keeping such agreements out of written contracts so as to appear within compliance of anti-trust regulations. 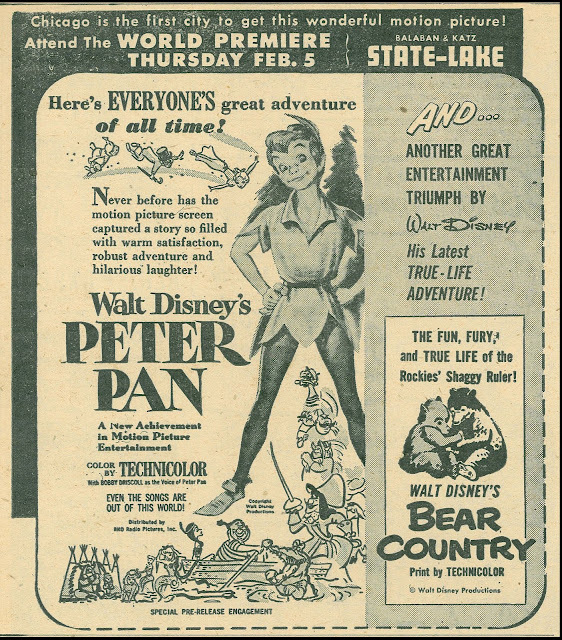 This sort of don’t ask/don’t tell was hard to regulate when obtuse showmen spilled beans as here when Boise, Idaho’s Pinney Theatre listed Nationally Established Admission Prices For "Peter Pan" in large print. It seemed few took worthwhile lesson from the confrontation. RKO came to Rube Shor later that summer with its terms for Hans Christian Andersen. He would tender thirty-two cents for each adult ticket sold and sixteen cents for every child. That was as good as forcing Shor and other exhibitors to increase their prices in order to pay the amounts specified. Whatever remedies were proposed or instituted gave little relief to showmen down the line. 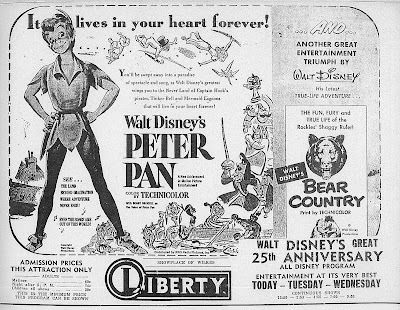 I pulled up the Liberty’s somewhat belated November 1953 run of Peter Pan and prices were inflated there as well, children’s seats being thirty cents when they were ordinarily a dime. This Is The Minimum Price This Program Can Be Shown, said Colonel Forehand in small print. Ironically, the product-split referred to by distributors was common practice between our Liberty and Allen Theatres. In ordinary circumstances, the Allen ran whatever of RKO came to town, except in the case of Peter Pan and Hans Christian Andersen. Both of those played the Liberty, and at increased admissions. I’d assume that Mr. Allen refused RKO’s terms, and Col. Forehand took both by default (the Liberty and Allen were our only hardtops circa 1953). Another nice inside view of all the gears turning to get 'product' to screens. Reads like much pain had to be endured by small theatres dealing with bullying distribution arms. As late as the early 60's at our local drive-in in upstate New York, the drive-in had to charge for children under 12 (Normally free) when they ran Disney pictures. Our local indoor theater didn't play Disney pictures except when they did a deal in the early 60's for a series of Disney pictures "By Special Arrangment with Walt Disney". Both adult and childrens prices were increased for this series. I only wish you could do such an in-depth expose of the practices used by studios today, John! This was a fascinating read, but all very innocent in light of the blatant violations of law and common decencey happening this very moment. As an first-run independent theater owner up against one of the nastiest of the megalithic chains, you can only imagine, the studios play favorites and circumvent the laws to no end. I enjoyed your article concerning Disney’s Peter Pan and the setting of ticket prices for the release. While I was not around when this happened, it reminded me of two other fights with Disney (Buena Vista Releasing) and theatre circuits. The first was in the spring and summer of 1978. Disney started a policy of minimum admission guarantee, which they said they would have to be paid film percentage on an amount no less than a set number. A theatre could charge less, but they would have to pay based on the set amount such as if the set admission for an adult was $3.00, the theatre could charge $2.50, but would still have to pay 60% of $3.00. This got around the price setting problem. The company I was booking for, Gulf States Theatres out of New Orleans, LA refused to play any product from Disney. The main reason was they still owned and operated many drive-in theatres across Mississippi, Louisiana, Texas, and Alabama. At that time children under 12 were admitted free. The Disney minimum was $1.00 per child to be charged film rental. The problem was eventually solved with Disney going down to $0.50 per child and the re-release of Jungle Book hit the screens that summer after an eight month fight. Gulf States did charge $0.50 for children at the drive-ins for Disney product and shortly pushed it across the board at all times. Later in 1988 I was working in national operations for United Artistes Theatre Circuit (they bought Gulf States Theatres in 1986) and they went out of business with Disney over non-negotiable film terms. This hurt Disney and UATC in the pocket book. Disney actually went out and encouraged mom & pop’s to open closed single screen theatres to run their product and rented out city auditoriums in towns where UATC was the only exhibitor. This fight lasted from the Fall of 1988 to November of 1989. UATC backed down and Disney did not. The reason was another film company went to non-negotiable film terms and UATC could not be out of business with two film companies. The tragic part was that Disney turned their back on the Mom & Pop independents that they talked into opening by the summer of 1990 and they were out of business. It seems as if Disney was always trying to get that price up and that was evident since a majority of their audience was children at the time and those tickets were half of what an adult was. The exhibitor would rack up in the concession stand so they were not as concerned with the gross as much, but certainly did not want to do anything, such as raising prices, to discourage attendance. Looking forward to your next writing. By the way I did pick up the Laurel and Hardy book you recommended. I have always enjoyed the L&H films, but until the last three years my exposure was only the Hal Roach films. With the Fox films out on DVD, I have learned to appreciate their later work and the book is a great companion to the films. Thanks. ... and Thank You, Allen!